The Elizabethan Theatre emerged from strolling players to performing in the yards of Inns, or Inn-yards, to purpose built theaters based on the huge open air amphitheatres of Ancient Rome and Greece to the comfort of enclosed Playhouses. A Playhouse was a small, private, indoor hall. Playhouses were open to anyone who would pay but more expensive with more select audiences. The audience capacity of the playhouse was up to 500 people. The huge success of Elizabethan plays produced at the Inn-yards and theatres and with play going becoming the height of fashion it was not long before a vast amount of plays were being produced indoors to ensure that plays could also be produced during the cold winter months. The indoor theatres called playhouses were born . The playhouses helped the acting troupes considerably as playhouses allowed for an all year round profession, not one restricted to the summer at the mercy of the English weather. Playhouses also allowed for luxury and comfort for courtiers and the nobility when watching a play thus encouraging wealthy and powerful clientele. Many plays were produced in buildings with Great Halls which were suitable for the purpose of staging plays. The Gray's Inn and Whitehall were two such theatres and were easily converted into playhouses. Purpose built playhouses were also specifically built such as the Salisbury Court playhouse. 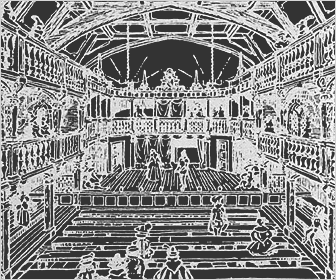 The information and facts regarding the development of indoor Elizabethan playhouses provide an interesting insight into the development of the modern theatre.